Weather doesn’t work on a calendar. You don’t have to either. Secure your spot on our Storm Chasing Flex List for $499.99 deposit. Adventures limited to six guests and will be a minimum of 3 and maximum of 5 days. Cost is $433.33 per day and is due before start of adventure. While our supercell adventures are held at the climatological peak of severe weather season, tornadoes happen every month of the year. Outbreak type events, where multiple storms produce a high number of tornadoes are often able to be forecast several days in advance. This provides us with a unique opportunity to offer guests a chance to choose when they get to go storm chasing. Sign up to be added to our Storm Chase Flex List. Put down a deposit to secure your spot. We will email those on the list when a setup appears favorable to produce tornadoes. If you can attend, just make your final payment and meet us at DFW to depart for your adventure. While this doesn’t guarantee you a tornado during your adventure, it does give you a slightly better chance than just taking a shot in the dark on a May or June scheduled adventure. Large and violent tornadoes often occur outside of typical “tornado season”. The cost of lodging and transportation throughout the duration of your adventure is included in the total cost. Personal portfolio review from Jason Weingart. Anything else you need, just ask. If it's within reason, we will do everything we can to make it happen. Bonus! Jason Weingart's Landscape Photography Editing Tutorial. "The workshop was fantastic! I went in not knowing how to use my camera outside of auto mode. By the time the tour was over I understood how to use the features of my camera just fine, and got some amazing pictures to show for it - with minimal editing no less - and now that I know how to work it I use the manual settings and have taken some outstanding pictures since then with what I learned! I enjoyed it so much I'll be doing it again this year!" 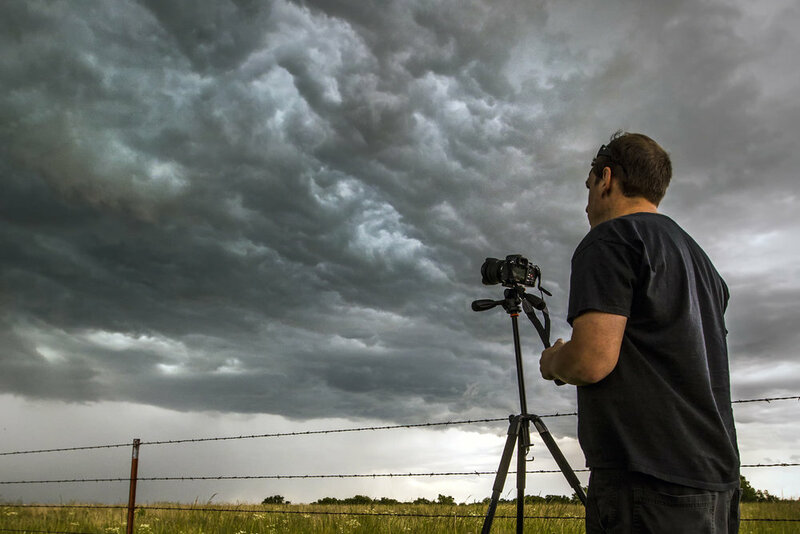 "My lifelong dream was to witness a tornado, so I signed up for Jason Weingart's Supercell Adventure. We saw 13 tornadoes in 3 days! It far exceeded my expectations. I didn't just get to witness supercells and tornadoes, I also got incredible pictures and videos of them to take home to show my family and friends. *If you would like to speak with other guests, please email Jason@JasonRWeingart.com for a contact list. Have you seen the movie Twister? Great! It's hardly ever anything like that. Storm chasing can be a grind. We will drive you to the best severe weather setups in the country on the day of your tour. Sometimes this means long drives. A typical day can easily see two to six hours driving. All that said, the driving is worth it. Every single mile. You will see things most people will never see in their lifetime. Storm chasing is an adventure like nothing else in the world. Most guests take home pictures better than anything they have ever shot. We have a lot of fun. The vehicles are very comfortable. We run two full size SUV's to assure plenty of room for guests and luggage. We make restroom and snack stops as needed. We try to eat at good places when time allows. Often it's breakfast at the hotel, a quick lunch, and a good dinner at a local restaurant. We only stay in clean hotels, rated 3.5 stars or higher on Trip Advisor when possible. Our team stays at the same hotel as our guests. You will leave your storm chase with a thorough understanding of how to forecast severe weather, position yourself to document it, properly take the images/footage, bring it all to life with post processing software, and sell your work to make some money and obtain more exposure. We will also touch on some other genres of photography throughout the course of the trip, including astrophotography, sunsets, and more. If there happens to be a day of inactive weather, we will still make the most of our time by shooting scenic images and improving your techniques. Learn how to stack lightning images. Learn how to sell your images and videos to national media outlets. Please do your best to pack lightly. Ideally each person will have no more than a small to medium sized suitcase, camera bag, and tripod. Do take into account we will be likely be traveling and staying in different cities each night, so you will plan to take your gear to your room each night. Some guests choose to focus on the thrill of the chase and bring a small camera to shoot with, which is absolutely fine. If you want to take full advantage of the photographic and learning aspects of the adventure the list below will cover all of your bases. Comfortable clothes for the day and warm clothes for the night are recommended. Equipment is not provided by the workshop. If you have any questions about equipment, use the form at the bottom of the page, and Jason will answer your questions as soon as possible. Here is a list of suggested items. A wide angle lens of at least 24mm with an aperture of f/4.0 or less. A telephoto of at least 105mm may also be useful. GOT A QUESTION? USE THIS FORM FOR A PROMPT RESPONSE FROM JASON.